The News and blogs are ablaze with this latest Obamania/c "arrogance". What's next? Obama's nose to the sky Leninist style headshot Poses draped on our Government buildings? Mother Farrakhan Uniforms? "Vero Possumus"; Latin for, "Yes we can"?? or, Very Pompouspossum? 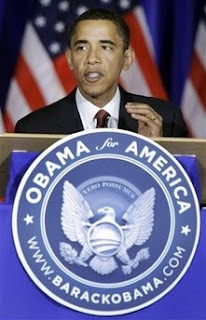 Barack Obama’s presidential campaign is retiring a presidential seal that made its debut at a Chicago event last week. “It was a one-time seal for a one-time use,” Obama spokeswoman Jen Psaki said. Yeah, right!... a one-time deal for the seal. And, there goes the ole' posthumousoppossum under the bus like a flattened road killed hubcap. Come on now, Who Knew? Dang it, and I only won 50 cents in the pool. Off by 3 hours! Remember to check out the New hcfjm.com Info. Archive for all past posted hcfjm ObamaSInfo. Love your blogs, Graybeard! Keep 'em coming. Good work! It's nice to have a positive posting. A lot to dig up and try to keep up with for sure! Obama's Birth Certificate: What's to HYDE?